This image shows the smoggy, fuzzy atmosphere of Saturn's largest moon, Titan. It is the only moon in the Solar System with a thick atmosphere. This dense atmosphere is composed of nitrogen. Traces of hydrocarbons give it a yellow-orange color. 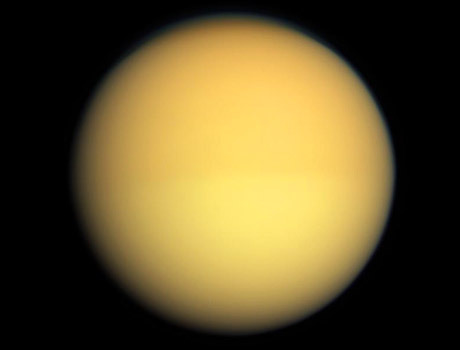 Titan is Saturn's largest moon and is the second largest moon in the Solar System. It is actually larger then the planet Mercury. The Cassini mission to Saturn confirmed that Titan has oceans of liquid methane on its frozen surface.